Firstly of course thank you to everyone who took part and attended ‘Purple‘. We will be showing full documentation here very soon once we have gathered all the images and film we can. To get an idea of those that have surfaced already then take a look at our Facebook page. Tonight though you can catch Rosanne Robertson performing at Penthouse NQ, the projected she has started up with Debbie Sharp. Rosanne gave us a sneak preview of her new incredibly powerful performance at ‘Purple‘, well worth catching. Also tonight you can catch Andy Parker and Kate Lucy, Andy is a present member of ur:and Kate a pervious member. The theme that connects them in this project is an ongoing quest to capture a feeling of what they define as ‘human-ness’ within their art work; a notion of the person featured whether it is within a figurative portrait of an actual person or the impression left behind by someone’s presence or actions. Our next artist to be named for Wednesday night, presenting his work ‘Purple in a Frame‘…….John has had a lengthy career in the IT industry as a systems analyst, designer and engineer as well as a trainer, presenting courses and seminars throughout the world. He has always had a keen interest in the creative world, but has only recently changed from a keen follower to a practitioner. Undertaking the Interactive Arts program at MMU John is an ideas led artist that uses any appropriate medium to realise his work. As well as producing work John has curated and presented exhibitions, most recently at Didsbury Parsonage, working as part of a small team to present “Div\sion of Power”. Though much of his work has serious intent, “Purple in a Frame” is meant to be simple, absent of meaning, and hopefully, simply nice to look at. 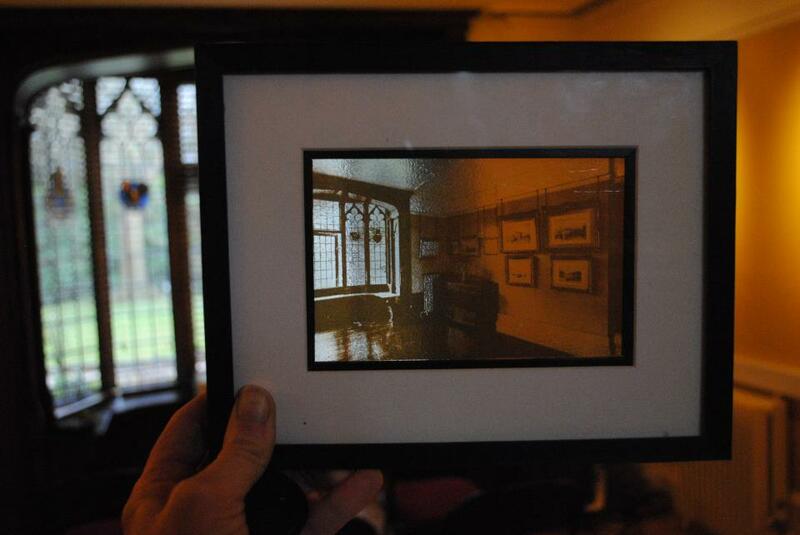 The below photograph is of a work produced for Didsbury Parsonage. It is a Victorian photograph transferred to glass. In this example you can look at Didsbury Parsonage library as it is today, through the image of how it existed over one hundred years ago. The view can align the image and the scene almost exactly. The artist is not aware of any work of this type being produced before. 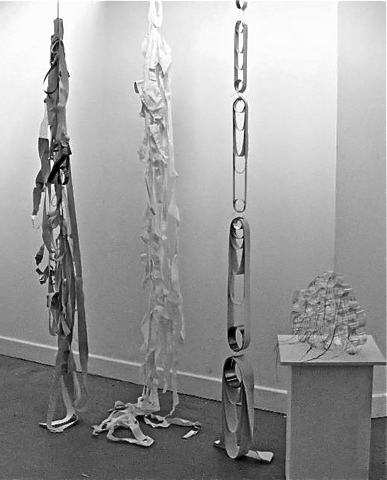 Rosanne Robertson is an artist often using action and sound. Robertson was recently selected as an emerging live artist and provocateur of Manchester by Doodlebug for Dazed and Confused. – Michael Anthony Barnes-Wynters (aka Doodlebug). We’ve been trying to get Rosanne to perform one of her works within our ur:nights for a while, and finally we have her. This is a busy time for Rosanne as she has just been setting up the Penhouse NQ; “A new not for profit artist’s space in Manchester’s Northern Quarter. A place for making, doing, sharing and showing”, which I recently visted. They are welcoming of visitors and have plenty of initiatives for artists to become involved with, I know Sandra Bouguerch is contributing to their ‘sound archive’ project and there are various residences for those wishing to spread their wings. This is bound to become a thriving art enclave, the views across the city rooftops and boundless light streaming in is sure to inspire anyone working on those beautiful wood block floors. Don’t just take my word for it, their website tells much more (http://thepenthousenq.tumblr.com/). There is more to Rosanne Robertson though, take a look at her website (http://rosannerobertson.com/) to get an idea of where she is coming from with her art practice, or keep up to date with her through Twitter, (https://twitter.com/R0sanneR). The second artist we are announcing for our Purple night is textile artist Maria Walker. Maria is currently studying for her MA at Chester University, she will be creating an installation which comments on the subversion of the use of the colour purple and mass consumption in the fashion industry generally. To get a feel for what Maria’s work entails please take a look at her website, blog and Facebook presence. Recently Maria has been collaborating with the poet Angela Topping. The result of the collaboration, which is a combination of poetry and textile based art, was exhibited at the Brindley Arts Centre, Runcorn, in 2011 and us currently being exhibited at the VAC Gallery in Northwich (until 15th March). It will then move to Sale Waterside Arts Centre in May until September. It will be superb to see what Maria brings to our night, we haven’t engaged with a textile artist like Maria before so we don’t know quite what to expect!!! Live performance duration is instinctive. Sandra Bouguerch is an interdisciplinary artist exploring her ongoing enquiry into the Notion of Self. Her practice incorporates an array of media such as installation, photography, sound, performance, video and text through which she creates atmospheres containing vulnerability and uncertainty. The basis of my practice is my individual experience of life, and, as such, I am often the central subject. This has been recently amplified through performance highlighting the many commonalities, both physical and psychological that inform the human condition. Her aim is to suggest a state of affairs that carries the body to another form of conscience, reflecting an unstable realism that is often uncontainable, encompassing unpredictable circumstances. Purple packed night on 27th Feb, 8-11pm. We are now in the process of announcing our next event, Purple. Not only do we have ourselves and our guest artists this night, but pre our night from 6 until 8 we have as part of the Islington Mill ‘Intervention’ talk series, have the invited artist and graphic designer Michel Bouvet. Graduated from the Ecole Nationale Superieure des Beaux-Arts, Paris, Michel Bouvet is a poster artist and graphic designer. Living and working in Paris he has designed hundreds of posters for theatre, opera, music, dance, art, festivals and public institutions in France and abroad. He has had more than 70 personal exhibitions in 35 countries around the world. His studio works for theatres, public institutions, museums, festivals and publishers. Michel Bouvet is a curator of graphic design exhibitions and professor at the ESAG Penninghen in Paris Michel Bouvet is a member of AGI (Alliance Graphique Internationale). We can also announce the first of our featured guest artists Sandra Bouguerch. Sandra performed at White; a particularly emotive piece ‘Eyes Wide Shut‘, which you can see documented through both her own Vimeo film channel and our documentation of the night. You can also catch some more of her recent work featuring her father which address’s areas of vulnerability in regard to the onset of old age. Vimeo channel. (http://vimeo.com/bouguerch).